Today, I host author Ann Miller. Ann earned a BA in creative writing from Ashland (OH) University and writes full-time in Phoenix, but left her heart in New Smyrna Beach, Florida, where she grew up. 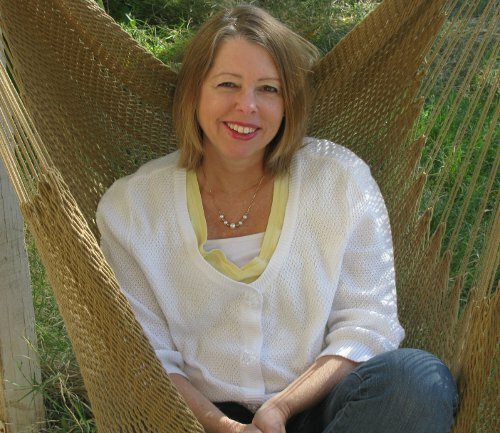 She loves speaking to young adults and guest lectures on writing at several Arizona colleges. When she isn’t writing or muddling through some crisis—real or imagined—you’ll find her hiking in the Superstition Mountains with her husband or meddling in her kids’ lives. 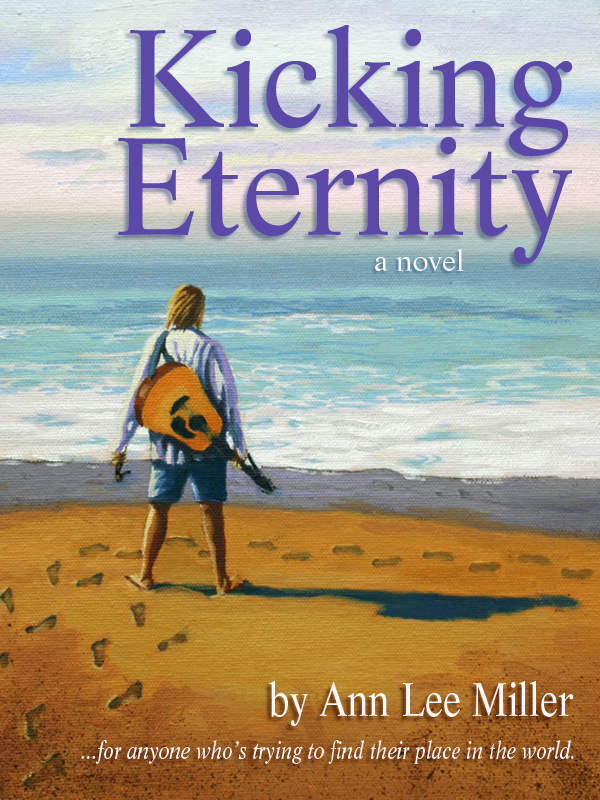 Anyone who leaves a comment with an e-mail address will receive a free e-book copy of Kicking Eternity, Ann’s featured book. Those who don’t want to leave an e-mail may contact Ann for their free book at AnnLeeMiller.com. Thank you, Ann, for being on the blog and for being so gracious with your book. Tell us a little about yourself. My younger brother and I grew up in Miami, Stuart, and New Smyrna Beach, Florida. My parents’ marriage melted down throughout my childhood, culminating in their divorce when I was thirteen. All the angst in my childhood made me hungry for God. I searched for Him from age sixteen to eighteen at mass, repeating memorized prayers, writing letters to Him, teaching catechism class. My RA in college had a deep friendship with Jesus that I instinctively recognized as authentic. It was through her influence and encouragement I stepped into a life-long relationship with God. I married a pastor and raised three sons and Her Royal Highness, 28, 25, 23, 21. We’ve lived in Ohio, Indiana, and Arizona. Two-thirds of our congregation is made up of teens and young adults, so it’s not surprising I write for I write for young women aged 15 to 30. I especially want to reach those who with unhappy, dysfunctional families like the family I grew up in. I want to give them hope that God will provide love and healing for them. Tell us something about you that would surprise readers. My father spent several years building a forty-foot sailboat in our backyard. We launched it in the Miami River and lived aboard at Dinner Key Marina when I was eleven until I turned thirteen. At the time I didn’t realize how unusual it was to live on a boat and ride my bicycle down the dock each morning to attend school. All my friends at the marina did the same. After school every day, I tossed my books onto my bunk, shimmied into a swim suit, and jumped overboard. Sailboats show up in all my books thus far. Were you an avid reader as a child? What did you read? I was the kid with the flashlight under the covers reading everything. When I was twelve, my mom and I read Gone With the Wind aloud on a family sailing trip around the Florida Keys. What is your favorite genre to read now? Romance and coming of age, which is also what I write. As a child or teenager, did you ever dream of being an author? I always say I became a writer the year I discovered Sister Sheila had hair. I was in fifth grade at St. Hugh’s Catholic School in Miami, knee deep in nouns and verbs, when Sister Sheila walked through the door in a new habit that showed two inches of mouse brown hair threaded with silver. Thanks to Sister’s encouragement, I went on to earn a BA in creative writing from Ashland (OH) University. And living on a sailboat, an aquaculture for mold and dysfunction, shoved me—in lieu of therapy—into writing. Tell us about the journey to getting published. I wrote my first novel fifteen years ago and have been writing full-time for ten years while trying to break in to traditional publishing. Last summer my agent let all her unpublished authors, including me, go. In the midst of my despair, God nudged me to indie e-publish. So, I swallowed a hairball of pride and walked down the self-publishing road. I feel a surge of joy and gratitude that my books are finally being read. The part of me that clamors for validation still hopes for a traditional publishing contract. But how can I go wrong obeying God? In addition to Kicking Eternity, The Art of My Life debuts in September, Avra’s God in December, and Tattered Innocence next March. Kicking Eternity is all about chasing dreams—our dreams, God’s dreams, and the mixed-up tangle of both. The artist in Cal begs to paint Raine’s ivory skin, high cheek bones, and internal sparklers behind her eyes, but falling for her would caterwaul him into his parents’ live. No thanks. The girl was self-righteous waiting to happen. Mom served sanctimony like vegetables, three servings a day, and he had a gut full. My daughter has had a passion to become a foreign missionary since she was in first grade. She just completed her junior year of college and is still headed for missions, probably to an orphanage in Peru. Also a close family friend fell in love with a young man and felt strongly that God told her to marry him. When the guy broke off the engagement, she was devastated on multiple levels. In Kicking Eternity the hero has to come to terms with the same dilemma. Sometimes the ideas come out the things I am praying for on a long-term basis. These deep hurts in my friends’ lives worm their way into my heart. Or it’s my own pain. Other times some small detail of life sticks in my brain. One day I was driving and listening to Misty Edwards worship music and thought how deeply her voice ministered to me. This led to a character who fell in love with a girl’s voice before he ever met her. Do you put yourself into your main character, or do you find yourself borrowing from family or friends as your characters develop? Writers are vultures. We scavenge from our own lives and those around us. Is there any scene in your book that came from a real-life happening? Not a scene, but I transplanted Our Lady Of The Hills Camp which I attended growing up from Hendersonville, North Carolina, to New Smyrna Beach, Florida. Are you a plotter, a pantster, or somewhere in between, and can you elaborate on your answer? I detest plotting, but consider it a necessary evil. I plot every scene for the whole book before I actually write the book. It takes… forever. My first two books were written without plotting. Going back through whole books to fix plot lines felt counterproductive. I tried Randy Ingermanson’s Snowflake method of plotting for my third book and Karen Wiesner’s First Draft In 30 Days for my most recent book. I also use Jack Bickham’s Scene and Structure as I build scenes. To me, it feels so much easier to make changes to the book’s skeleton than to rewrite large portions. What are your favorite themes to write about? What is your Writing schedule like? Do you write only when inspired? Since I started my writing career in my forties, I feel fairly obsessed to accomplish what God created me to do. Think about how the hero in Sweet Home Alabama jammed lightning rods into the sand to make his beautiful glass. He did his work before the lightning struck. I jam a lot of words onto the page before lightning strikes and makes it beautiful. Share something about your day-to-day life that might help a reader to feel as though they know you a little better. Wedged in between my writing I manage to hike in the mountains with my husband, do Zumba, and go garage saling every Saturday morning with a friend. This year I mentored three teens from my youth group. I’ve guest lectured on plotting in Phoenix colleges for the past few years. Every summer you’ll find me at teen church camp—one more reason for setting Kicking Eternity at a church camp. Does your faith affect your writing? How? I have a prayer team of eighty people, who for reasons known only to them, said yes when I asked them to pray for my writing. I was inspired to do this by author Robin Lee Hatcher who saw no reason to wait until publishing to recruit prayer support. Also, I pray through every aspect of my books. Often, my prayer for the manuscript file is half the size of the book. This makes me feel like I’m working on a team with God. I pray first thing in the morning about the work ahead and go back to pray through any sticky situations I encounter. I think God delights to answer my writing-related prayers. He seems to wait for me to ask. I see miracles everyday. Do you have a favorite scripture? If so, why is it your favorite? I love Psalm 91. It’s all about living under God’s shelter and safety. It’s kind of goofy, but when I read Psalm 91, I picture myself in a little shack on top of a really tall Dr. Seuss hill—safe in God’s shadow. Have you won any awards with your writing? Kicking Eternity won First Place Long Contemporary in the 2009 Romance Writers of America Faith, Hope, and Love Contest. If you could have dinner with someone famous (dead or alive) who would it be? Author and speaker Evelyn Christenson was the person who inspired me to become an intercessor. Once at a seminar she hugged all the ladies in the restroom line including me. I’d love to say thank you. What is your number one spiritual gift? Where can fans find you or your books on the internet? Thanks, Ann, for joining us today! Love Inspired’s Susan Sleeman – Best-selling author offers a GIVEAWAY! Sherri and Ann–Good morning-nice interview. I have never lived on a boat, but I think it would be amazing. Also, the Scene and Structure book has helped me so much in my writing. Also, James Scott Bell’s Plot and Structure. I think I need structure. And kudo’s to you for plotting even when you don’t like it. I can’t!! Tried, but for now am doomed to the mess that is the first draft until the revision process is through. Lindi, what email address would you like Ann to send your free eBook to? Mippy, what email address would you like Ann to send your free eBook to? Hope you enjoy the book. I’ll be sending them out tomorrow when I get back home. My husband surprised me with an overnight anniversary trip for our 32nd! Just ducking in here for a sec to say hello. Maxie, To Dance Once More is my book. I do have it available in eBook and print. You can go to my BOOKS page on my site and follow the link to Amazon. Ann’s book that she’s giving away for free is an eBook. Hope this helps. Thanks for the anniversary wishes everyone! We had the best anniversary ever–hiking, sitting beside a creek, and Dairy Queen. Perfection! Sandra, thanks for stopping by. So nice to cyber chat with someone who has lived in Florida. Maxie, I’m with you–reading books on the computer is not my favorite thing! I hope my book comes out in print someday. 🙂 I’m sure you will enjoy Sherri’s To Dance Once More. She and I cover similar themes set in Florida, Sherri’s historical, and mine contemporary. Susan, I love all that enthusiasm!